Do they pull it off? Kinda… Let’s talk about it. Few games are followed by a hype train as vast as Destiny 2. In Bungie’s first major franchise release since passing off Halo to a different studio, the original Destiny was mostly well-received, especially from the players that stuck with the DLC that contained some of the game’s best content. It sold well. It played well. But it wasn’t perfect. There were some clear strides to be made in the game’s narrative and world-building, the repetitive grind to improve your gear, and a multiplayer offering that lacked the addictive nature of games like Halo. Many people believe that these points made Destiny fall just short of being a great game; instead, Destiny was a ‘just’ a rather good one. Destiny 2, like so many sequels, is a giant beacon of hope for the players that wanted to, but couldn’t quite, fall in love with the first game. It’s an opportunity for Bungie to put together the depth of experience that players are looking for in a high-end shooter that combines with the most appealing traits of an ARPG like Diablo. Guns feel strong and provide a tactile feedback that some games so desperately need. Although I wouldn’t say each gun feels completely unique from the next, the way enemies respond to your attacks and how you’re able to chain together long strings of kills can be really satisfying. The developers at Bungie have taken an approach of ‘if it ain’t broke, don’t fix it’ -- and how can you blame them? Almost everything about the game’s action feels right. I have some gripes about how long it takes for your abilities to come off cooldown, and how few of them you have, in general. I also found myself occasionally frustrated by the limited movement that made me feel like I couldn’t avoid foreseeable damage. I’d like to see those things cleaned up in future updates, but if you’ve enjoyed Bungie shooters in the past, this is going to feel smooth and familiar. The campaign missions in Destiny 2, however, leave a bit to be desired, in that they do just about nothing we haven’t seen before: Big bad guy has big bad thing that will blow up lots of stuff. You, hero person, stop them! 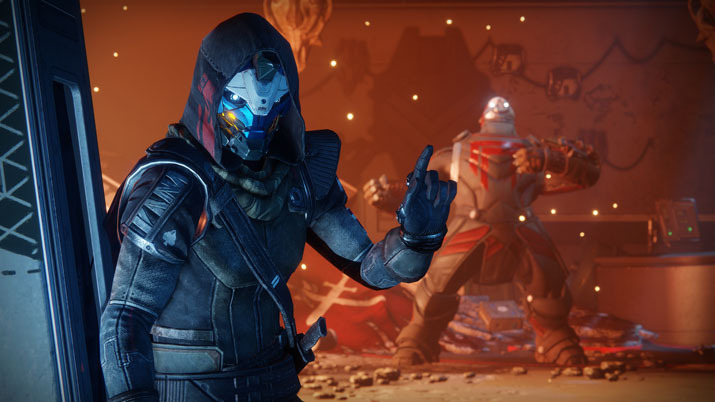 Although there seems to be attempts to give the characters a bit of personality, every character in the game, especially Cayde-6, are defined entirely by one trait. Cayde says funny things. That’s it. Now Cayde’s holding a chicken, isn’t he funny? With a cast of characters so wooden and one-dimensional, it’s difficult to care for their losses and empathize with their struggles. And when the villain is just another Bane/Muppet hybrid with a god complex, I check out. I get to the boss battles and enjoy myself, but the intensity of these encounters aren’t as enthralling as they could be, were I more compelled to care about the game’s characters. I’ve learned to temper my expectations when it comes to character development and plot structure in AAA video games. To its credit, Destiny 2 puts together a coherent story that doesn’t have the giant plot holes which might mar the experience of the first game. Everything here makes sense, but none of it will surprise you. Although everything looks good at a surface level, that doesn’t mean that the design is completely sound. The Destiny series should have been on the PC from the beginning. While I was consistently surprised by how good the game looked on consoles, seeing the detail of the world around you and the remarkably smooth character animations with fps that never dip below 60 is an absolute treat. From a technical standpoint, this game looks and feels natural on the PC platform, and it’s got to be one of the best ports in recent memory, from a graphical and optimization standpoint. The concept of travelling to different planets is entirely a novelty. You only ever explore portions of a planet the size of a large city, at most. So why make us “travel” across the galaxy? From a design standpoint, it seems to make more sense to have a single planet where different portions of it have been taken over by the game’s various factions. Rather than each new area’s basic aesthetic being defined by The Traveller, and how it’s affected that planet, it’s defined by the faction that inhabits it. This would give more meaning to the environment and create opportunities to explore vis-à-vis the different cultures fighting over the landscape. Instead, each new area feels like it has no relationship to the last. Once you learn where certain events spawn, you’ve discovered most of what that planet has to offer. This game didn’t need Fallout: New Vegas-levels of detail in its world to make the game more immersive, they just needed something cohesive. 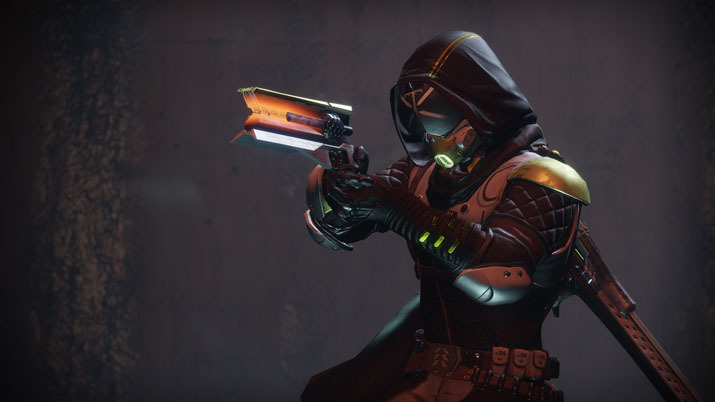 One of the big reveals in the story’s second act is “The Taken”: ghostly beings that follow the energy left behind by the Traveler. I like the concept, showing the residual effects of The Traveler’s presence, but they’re a reskin of other enemies you’ve already seen. 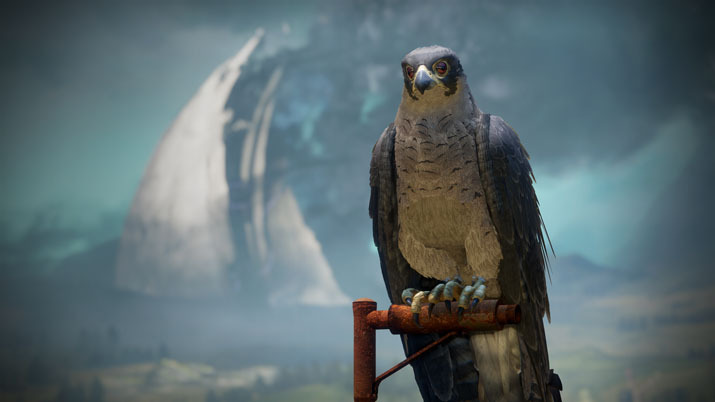 They behave a little differently from their early-game counterparts, but it felt like this was a missed opportunity to add a cool twist to the Destiny formula by adding a new set of enemies that presented a totally new set of problems for players to solve. Destiny 2 is a game that takes a classier, straightforward approach to the shoot-n-loot progression system that was most recently popularized by the Borderlands series. 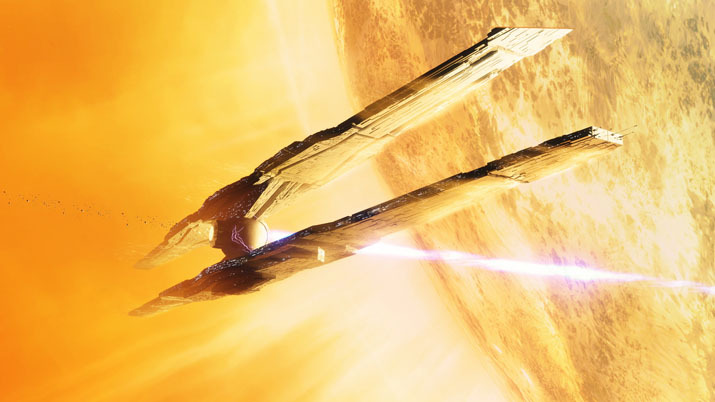 Bungie brought the refined shooter mechanics they developed in the Halo franchise and brought to a more ambitious universe and scope of the game’s overall concept. It’s a no-brainer as to why the Destiny series has had so much hype around both of its releases. And the result is gunplay that feels as tight and responsive as it ever has, and a progression system that feels weirdly automated and shallow in a few too many ways. The most egregious example of this is Darbi, the postmaster robot that collects all the equipment you leave behind while out there fighting bad guys. Everything you forgot to pick up or never saw can be found in the possession of Darbi. But isn’t looting your loot a big part of… you know… looting? I understand that it’s convenient, but I’m just being handed items I never knew that I missed in the first place; I shouldn’t be able to miss my items lying on the battlefield, if they are so important to the game’s hook. Legendary items should have a giant gold beam shooting from the sky and I should feel like a god when I pick it up. Instead, the friendly robot guy just kind of hands it to me. Even where players are given something resembling choice, the options are entirely too contrived. Improving your equipment is a huge part of Destiny 2’s progression system, with all equipment having a power rating called “Light” that tells you how strong it is. So, your choices most often come down to “do I want something with more power or less power?” Naturally, players are always going to take the more powerful equipment, so there’s your “choice” in build: better or worse. Destiny 2 gives players an illusion of choice, but offers the player just about nothing in the way of actual agency. You’re at the mercy of RNG in a way that takes away from the empowerment of the player. Which leads us to the ever-controversial microtransactions that make their first appearance in Destiny 2. You should know that, before starting this paragraph, I let out a heavy, un-ironic sigh. I’d like to think I’m not too much of a snob when it comes to spending extra money in the games I play. I rarely do it, but I’m always open to it, if the developer puts together content worth money beyond what I’ve already paid for access. I’m not grossed out by microtransactions in theory, but Bungie does not make a great case for their implementation in Destiny 2. Engrams are Destiny 2’s version of loot boxes. There are a few different varieties of these Engrams: Luminous, Legendary, and Exotic. They all contain some variety of high-end equipment, mods, and/or cosmetic items that can be earned in two ways: grinding out reputation with the designated NPC from each planet, or by spending Silver. Silver can be purchased with real money, and there are no guarantees as to what will actually pop out of your engrams. The Strikes, particularly The Arms Dealer, can be a blast when you’ve got a couple friends with which to play. It’s the kind of PvE content that is more than welcome to make its way over to the FPS genre, in my eyes. Working together in a similar way to the way we do in a World of Warcraft dungeon can have an amplified intensity to it when you’re really immersed in a firefight. Leviathon, Destiny 2’s large-scale Raid, has not yet been released to PC players. This content update should add a nice goal for players to reach, but once it’s been achieved, we’ll have to see whether or not it’s got the replayability that a WoW-style raid does. Of course, the multiplayer side of Destiny 2, what they call The Crucible, sees many of the same great qualities of the single player. Weapons feel powerful and responsive, and the action feels fluid. I like the way most of the maps are designed, even if there’s not much groundbreaking stuff going on here. I don’t have the attachment to individual maps that I do with other games. They’re different enough to keep things from feeling too repetitive, but they’re not all that memorable either. Where the multiplayer shines is in the ranked mode – basically, a round-by-round elimination. If you’ve played Counter Strike’s ‘plant the bomb or kill everyone’ mode, you’ll recognize this. There’s a nice flow to the combat that leaves you with just enough time to think about how you screwed up while you’re waiting for the next round, without making you stare at your idiot teammates as they screw up the round for you. I have a feeling that once they start implementing weekly goals and rewards to The Crucible, players are going to start caring even more. The weekly auras console players are rewarded for win streaks are appealing to my competitive side, to say the least. So, like so many things about Destiny 2, this is an excellent framework for something better to be hung upon it later. But all the good fundamentals of multiplayer are here. At times, Destiny 2 can feel like a badass simulator, rather than a game that actually wants to empower the player to supreme levels of badassery. All the elements are there: you’re gunning down massive hordes of baddies and you’re doing so with outstanding visual fidelity, a variety of weapons, and you’re able to cause this mayhem using big, explosive abilities. A bit too much of Destiny 2’s action is watered down by long cooldowns, the lazy sit-behind-cover until you’re full-health again, and the way enemies completely lose their ability to aim once your health hits the blinky-red portion of the on-screen health bar. This ended up having an odd effect on the way I played Destiny 2: I just stopped caring. It didn’t seem to matter when I died, when loot dropped, when events started, when I found something Ghost could “investigate.” The stakes always seem so low, the rewards so random and barely earned. If you just can’t get enough of Bungie’s multiplayer shooters, then this won’t disappoint most players with that expectation. But I’m not convinced that The Crucible is a game-seller on its own. Even with some outstanding in-game action and combat, the progression system falls flat in more ways than a game like Destiny 2 can afford. I don’t know if it was because of the microtransactions, or if they wanted to have an overly-simplified loot system from the start, but I just don’t find myself hooked to Destiny 2. It’s not a bad game, but it’s not one that lives up to the lofty expectations set by the way it’s marketed and talked about by its fans. Miles wide, but an inch deep: Destiny 2 is not the game it should be.